Dents, dings, marks and damage will soon start to accumulate on your board as car hits bumps in the road. This damage is very costly when you consider how much a surfboard can cost and also the price of repairs. Whilst a surfboard bag might provide a small amount of protection against this, what you really need is a surfboard rack pad to provide proper insulated protection. It also prevents the wax on your surfboard from getting on your roof or roof rack. We reviewed the best surfboard rack pads that we could find and out of these we discovered that the Dakine Aero Rack Pads performed the best. The runner up was the Dorsal Aero Pads with their own strap-less range. Also, honorable mention goes to the FCS Premium Soft Rack which is a surfboard soft rack that comes with as it’s own all in one system for people without roof racks. We reviewed these surfboard rack pads by looking at how they performed with regards to their durability, ease of use, style, price and size. We took all these factors in to determine which was the best surfboard rack pad and so check our our reviews below to help you make your decision. 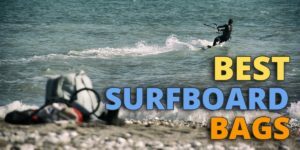 What to consider if buying surfboard rack pads? You need to ensure that the rack pad that you’re buying matches the width of the car or truck you’re driving. You should also check that it has enough diameter to wrap around the roof rack that you’ll be installing it onto. You need surfboard rack straps to attach your surfboard, roof rack and pads all together. Most surf rack pads come with straps already included but some do not so check this before purchase. Surfboard Soft Racks – are an all-in-one system that can strap to the roof of your vehicle by themselves, without the need for a separate roof rack. 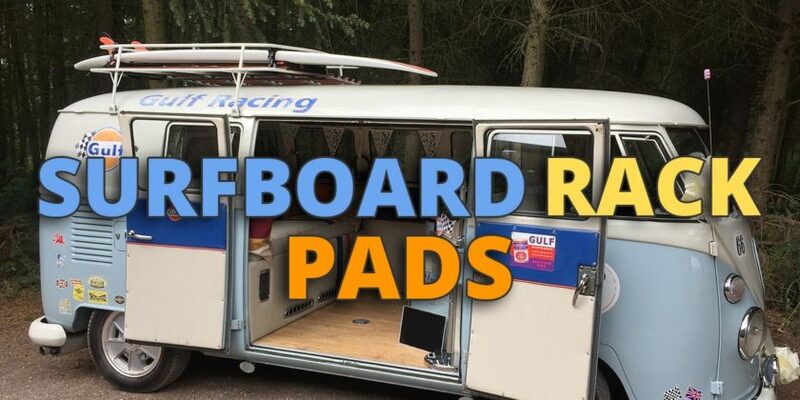 Surfboard Rack Pads – are pieces of padding that you strap around an existing roof rack system that your car has installed. All rack pads are normally made from weather proof materials such as polyester or nylon for the cover and aero foam for the padding. Also, if you’re carrying more that 3 boards then you want to look at the thickness of pads as well. On the lower end you’re likely to find rack pads being sold for $15 to $20 whereas higher end rack pads are likely to go for up to $50. Putting the rack pad onto the roof bar is usually done with velcro on the first stage. Then as the next step, a strap is also wrapped around the roof rack or car for extra security. Not a major concern for most people since black is the default color, still there are some colorful options available if you want to travel with style. Thick aero pads that are strong enough to support multiple surfboards. Made from heavy duty polyester materials. Possible to fit bars 2″ in diameter. Some users have reported issues with these rack pads not fitting Xterra cars. The Aero Rack Pad from Dakine is possibly the best product available on the market. Within your set of 2 rack pads you get quality materials, strong velcro closures and a flat bottom design that’ll fasten to almost all roof racks. Velcro is along the entire length of the pads for an extra strong hold. Thick EVA foam with a weather proof nylon sleeve. Secures well with minimal slippages. They do not come with straps so you also want to consider getting some. A great runner up, this Dorsal Rack Pad simply gets marked down as the straps have to be bought separately – otherwise the product itself is a winner. Easy to install with Velcro straps and nylon ties. Some customers have reported issues with the colors on the rack pads fading quickly. Other users have had issues attached the pads to Toyota cars. Whilst a good rack pad in terms of functionality, we’ve had to mark this pad down because the color fading issues that some users have reported. High end rack pad for premium customers that want quality. Strong heavy duty buckles allow for extra tightening. Compact carrying case makes it easy to fold away when not in use. Doesn’t require a roof rack, can be used on it’s own. Some users have reported minor vibration issues when travelling at high speeds. If you want and can afford extra quality then this rack pad from FCS should be your number one choice. First, attach the rack pad to the roof rack by folding it around each bar and then closing it firmly using the velcro straps. Optional: take your surfboard and place it in a surfboard bag for added protection. Place the surfboard on top of the roof rack. Surfboards are placed upside down on the roof of the car so that any the fins on the boards don’t hit the car roof. Additionally, consider removing your surfboard fins if you’re going on a long trip and they’re removable. Attach the rack pad straps to the car/roof rack and also the surfboard that you have placed on top. Ensure there are no twists in the straps to stop vibrations. Secure the straps tightly using the buckle provided. However, don’t over tighten your straps otherwise this can damage the sides of the surfboard. There’s a number of other items you might want to consider if you’re already looking at rack pads. Whilst a surfboard soft rack can be used on it’s own, some surfboard rack pads can’t be used without a roof rack to attach to. To see the best surfboard roof racks, check out our article here. If you use a surfboard bag, it will provide an extra layer of protection against damage and dings, plus they also make travelling with your boards that much easier. Check out our guide here for more information. Required for some surfboard rack pads that don’t come with their own straps. The surfboard car strap that we recommend is this one from Dorsal. Handy for securing down any loose parts of the surfboard that might wobble free, we recommend the 24 set of bungee cords from Cartman.